I’m sure you could offer all kinds of counter-arguments to what I’ve been saying from your own grading perspective. And you should; we all need to step back occasionally and consider what motivates our strong opinions. And I’m suggesting that our position within the myth of American innocence is a strong motivator. From outside the myth, others may see us more objectively. Perhaps Obama really has tried but been unable to reform a dreadfully wasteful and brutal militarism that has remained remarkably consistent, regardless of who has occupied the White House, for seventy years. We’d really like to believe that, because to think otherwise would be to call into question our most fundamental assumptions about who we are as Americans. To ask about our own collusion in perpetuating the story of American goodness and exceptionalism – despite all the evidence – would be to ask how we cannot see that the President has perfected the art of appearing to embody the Archetypal King – while actually enacting its shadow. Please keep this possibility in mind: such a con-act may not be a conscious process. 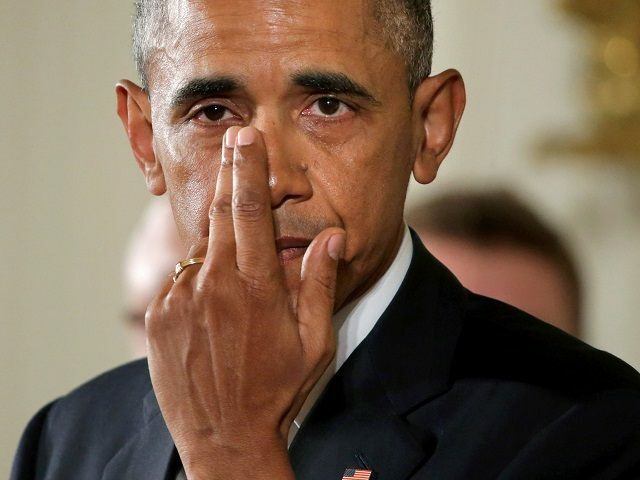 His tears for the dead children were real – and so are his murderous policies. In this sense, from the empire’s grading point of view, he has been a complete success. To bring this discussion back to mythological thinking, we remember that we all inhabit a story. And in this story Obama is a hired gun, brought in to shore up the cracks in the myth of innocence that had appeared during the George W. Bush years, and he has succeeded. In this grading perspective, even the Republicans (if they could ever be caught speaking honestly, off the record) would give him a straight-A. What about the anger, you ask. In American myth, nativist racism “trumps” progressive populist movement building. So far, the gamble has worked, but it may eventually backfire (see below). This raises a more fundamental question that progressives throw around constantly without really examining: good-intentioned mistakes rising from incompetence vs. deliberate, cynical policy. How many times have you heard this assessment (shared by almost all politicians, pundits and historians) that the Viet Nam war (Iraq, Afghanistan, etc) was a “mistake”? In this story, our leaders had the best of intentions – defending freedom and stopping the spread of communism – and it was only their own incompetence and changes in American popular opinion that defeated them. Noam Chomsky, however, reminds us that America invaded Viet Nam, to prevent it “…from becoming a successful model of economic and social development…” It was the Vietnamese people who won the war. This is one reason why Chomsky’s name almost never appears in the New York Times. And the only level on which this horror was a mistake was the moral level. It was a crime. It was intended as a crime, planned, prosecuted and perpetuated by Ivy-League criminals, and so was Afghanistan and Iraq. These were and are the crimes of imperialism, not innocent blunders. 1 – How can we direct policy so that the military – and its ever-increasing budget – remains permanently in a certain part of the world? 2 – How can we direct increasingly greater shares of the nation’s resources towards the military-industrial complex, the education-industrial complex, the prison-industrial complex, Big Pharma and the financial industry? 3 – How can we best manipulate the levels of irrational fear and anxiety so as to distract common people from such policies? 4 – How can we vet prospective political candidates to make sure that none of them ever question these policies? 5 – How can we serve up pliant legislators for lobbyists to shape? 6 – How can we make most Americans so utterly insecure about jobs, housing, education, health and the future in general that they will acquiesce to any of our demands? Now from that point of view, let’s ask another basic question. After seven years, have the one percent come to accumulate as much wealth as the bottom fifty percent despite Obama’s policies or because of them? In mythology, we recall, motivation doesn’t matter, only actions. Mythology looks at what happened and asks what needed to occur in order for the story to move on. If we pay attention, it also asks how we might reframe the story. Once again, what about those signs of mild, incremental progress? Saving the auto industry? Why not ask: what is the price of keeping these corporations alive even though they’ve outsourced most of their jobs to the Third World, when the obviously better solution is to buy them out at bottom-dollar prices and create worker-owned collectives? Answer: keep a few of those jobs in this country. Health care? Why not ask: What is the price of delivering vastly more wealth and influence to the insurance industry when the obvious answer is single-payer? Answer: mandate health coverage for some of the people. Cuba? Iran? Why not ask: What is the price of opening up new consumer markets totally nearly 90 million people in countries that were never any threat to our safety? Answer: Take actions that conservatives would never (claim to) support anyway. Nothing risked, nothing lost. Supporting gay rights? Why not ask: What is the price of securing some nine million potential voters for the Democratic Party, especially when we’ve done nothing to repair the fact that over two million African-Americans remain disenfranchised? Answer: Nothing at all. Again, nothing risked. I take no pride in this. It isn’t about venting my frustration or expressing gratuitous cynicism. It is about waking up from the dream of innocence, exceptionalism and good intentions. Before we can begin to reframe our stories, we have to realize that we have inhabited a very toxic one for our entire existence as a nation, and it still holds us by the short hairs. Ultimately I don’t care if you come to agree with my assessment of this president. I care that you come to realize how much of your thoughts are determined by the mythology of innocence that we all subscribe to, how much your longing for the return of the King in your own heart determines the idealizations that you project onto politicians and entertainers. Is there any difference any more between them? Trump knows the answer. And here’s something that everyone in Washington (including its 50,000 lobbyists) knows about the con-man: while you watch his right hand (Trump) moving the cups on the table, his left hand (Obama/Clinton) is in your pocket. May it be the age when the gatekeepers can no longer pull the wool over our eyes, when they can no longer serve up “leaders” charged with the assignment to repair the cracks in the myth of American innocence. And this leads us to a seventh and final way to grade Barack Obama – and, for that matter, all the bankers, industrialists, militarists, fear-mongers, the idle rich and all of their politician stooges, media lackeys and mendacious academics who have contributed to so much human suffering in their pursuit of power and influence. What if they were really asking: How can we cause millions of Americans to wake up from their dream of good intentions and exceptionalism? What can we do to provoke new gaps in the veneer of the myth of innocence so broad that they can never be shored up and re-sealed? How can we make the dam burst? Wouldn’t such questions bring us back where the myth itself wants us to go? And who would be speaking now? Wouldn’t it the ultimate grader herself – the Earth?